Third in our packaging guide series is how to deal with what can be some of the trickiest items to pack safely; glassware and ceramics. These items are obviously very fragile and often have delicate handles or protrusions which are easily damaged, so need a lot of protection. For more advice on protecting other awkward items, why not read Wrap it up: How to package unusual items. Here we list some steps you can take to minimise the risk of your prized porcelain being damaged while being transported. This entry was posted in Packaging Products & Materials on August 29, 2014 by Rajapack. Last June, the “RAJA Foundation – Danièle Marcovici” held its 2nd Solidarity Commitment Week at the RAJA Group European headquarters in Roissy, France. Raja employees were fully committed to this initiative thanks to the RAJApeople program. Raja employees can support charities all year long thanks to a micro donation scheme. So far more than €7,000 has been raised. The “microDON” (micro donation) is a payroll giving scheme whereby each employee can donate from a few cents to several euros towards the Foundation. The funds raised are doubled by the company and are donated to a charity chosen by the Foundation. This year, the winning charity of the RAJApeople Award is the “Association pour les Femmes en Situation Précaire (AFESIP)” – Association for Women in Vulnerable Situations. 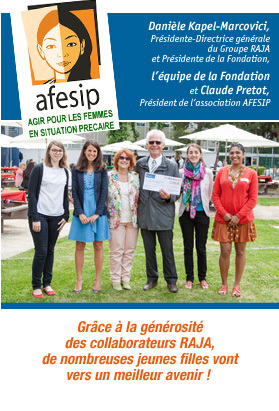 On June 20th, a cheque for €7,076.78 was awarded to Claude Pretot, President of the Association, by Danièle Kapel-Marcovici, President of the Foundation and CEO of RAJA Group at the European Group headquarters in Roissy. This entry was posted in Charity Work on August 13, 2014 by Rajapack.